Product roadmaps and release plans are both important tools for a product manager, but they have very different purposes and should not be confused. A product roadmap communicates the high-level overview of a product’s strategy, while a release plan is a tactical document designed to capture and track the features planned for an upcoming release. A product roadmap should serve as a high-level, visual summary of the product’s strategic objectives and expectations. If built properly, the roadmap can be a valuable tool for several reasons. It can help a product manager present her plan in a compelling way to her executive stakeholders, to help secure their buy-in. It can help a product manager communicate the product’s strategic vision and goals to teams across the organization. And it can be a helpful resource the team can refer to throughout the product’s development, to ensure they are still executing according to plan. As such, the roadmap should contain only strategic-level details—major product themes, epics, and goals. Of course, you and your product team will need to translate your roadmap’s high-level strategy into an actionable plan built on specific features, enhancements, and fixes to build. This is where a release plan comes into play. The release plan communicates those features and enhancements slated for your product’s next release (or the next few releases). So it acts as more of a project plan, breaking the big ideas down into smaller projects your team can make progress on. This is how the product roadmap and the release plan can be used together for effective product planning. When you’ve built out your product roadmap and earned sign-off from your stakeholders, you can begin turning those broad themes you’ve planned—“Offer a self-serve portal for customers”—into specific features and benefits that can be added to your release plan: “Credit card processing,” “eCommerce front-end,” “In-app training and onboarding,” etc. Let’s look at an example of both a product roadmap and a release plan. 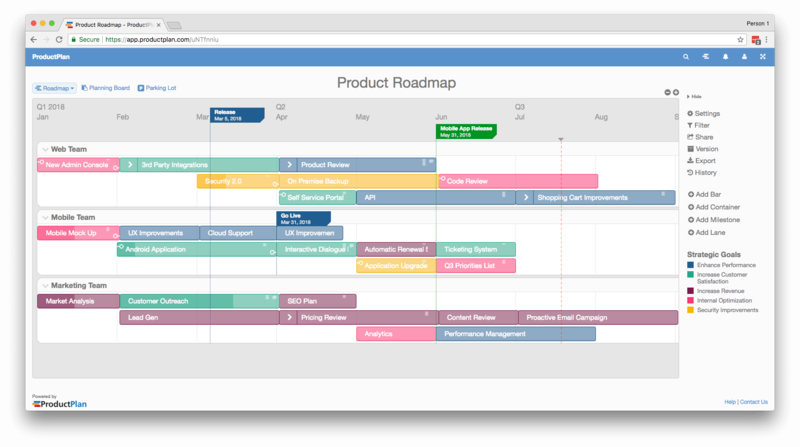 This example roadmap, developed in ProductPlan’s web app, is designed to communicate the product’s various strategic goals—such as enhancing performance, increasing customer satisfaction, increasing revenue, internal optimization, and improving security. You can see all of these goals, and their corresponding colors, in the legend along the right-side panel. This color-coding helps each group involved (web, mobile, marketing) to quickly see how the initiatives they’re working on align with the company’s larger goals. But as you can see, these are all high-level themes and ideas: “New Admin Console,” “Cloud Support,” etc. What the product manager will need to do next is translate these into more granular, more actionable projects—and put those on the release plan. Note: You can use this example as your product roadmap template. This example release plan, also developed using ProductPlan’s app, is divided into four sprints of about two weeks each, with milestones representing the expected release days. The bars represent the major initiatives for each sprint, color-coded to indicate priority level. Note: You can use this example as your release plan template.